Initially commissioned to produce paddock fan magazine iGNITION in 2012, Sine Qua Non’s relationship with Williams evolved into a broad content development portfolio. Responsible for multiple publications, SQN provided full end-to-end production including editorial planning, interviews, content development, design and print management for each. Up to the end of 2013, iGNITION was a printed magazine published in English, Spanish, Portuguese and Finnish. Five issues were produced at key moments during the season, usually prior to the Australia, Monaco, Britain, Singapore and Austin Grand Prix events. In 2014, iGNITION was transformed into a fully digitised app/online magazine solution, available to download on Apple and Android devices as well as to view online. It was an industry-leading fan engagement solution for motorsport and saw an exceptional global reception. 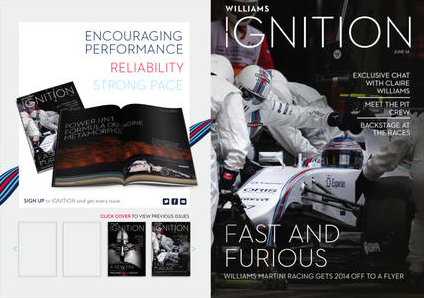 In order to maximise return on investment as the app developed, SQN worked with Williams on integrating iGNITION into the team’s social media platforms and activities. After a successful first year with iGNITION, SQN was asked to produce an internal communication magazine for around 650 personnel including Williams Advanced Engineering. With eight issues per year, Williams Matters was produced every six to eight weeks, providing employees with a fun but informative update on life within Williams. From the start of 2014, SQN also produced the team’s VIP Hospitality Race Guides for all Formula One Championship rounds. Designed to provide guests with an overview of Formula One and the 2014 championship, as well as the Williams team and its unique heritage, the 48-page full colour booklet offered race-by-race insights for several thousand guests each year.